Early April 2009, the first solo exhibition of fashion designer Jean-Charles de Castelbajac opened @ Paradise Row in London. " Paradise Row" presents the 1st solo show of Jean Charles de Castelbajac & is located is in the heart of East London arts district, Brick Lane. The exhibition is open until May 2nd 2009. I am making plans 2 go next Wednesday! This news excites me! Moving on to discuss the enormity of Castelbajac's career as a designer, his collections have been linked to collaborations with (some 'late') artists including: Jean-Michel Basquait, Andy Warhol, Loulou Picasso, Bettina Rheims & Stephen Sprouse. In following his ♥ for design, Castelbajac's career began when he learned to adopt the concept of " Cultural Hijacking" learning that the synthesis of images, signs, symbols and styles CAN be hijacked for use of cultural photo-copying. 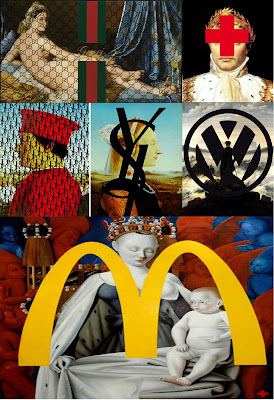 Castelbajac recycles various art forms into modern visions thereby taken from previous artistes... simply by borrowing inspiration. Using this formula, Castelbajac has now become a contributor of contemporary visual culture in the world of art. *Ending content (above) taken from Paradise Row.